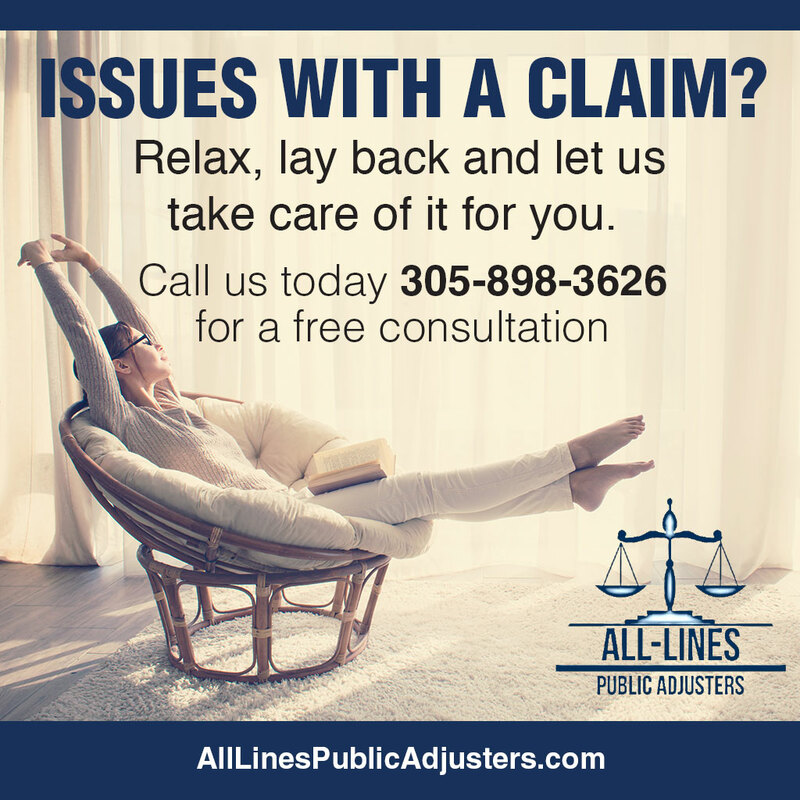 Get started now by calling us at 305-898-3626 to discuss your claim. Q: Why work with a Miami based Public Adjuster? A: The insurance companies have experts on their side – so should you. A 2009 survey by the State of Florida found that there was a 747 percent increase when an adjuster was hired at the start of the claims process. Q: What does a Public Adjuster do for you or insurance company? A: ALL-Lines Insurance Adjusters will identify, quantify, and establish the full extent of loss to your home or commercial property from wind, fire or water with your insurance company. We will package and present the claim to achieve a favorable recovery. A: There are no upfront costs. ALL-Lines only collects when you get paid. Q: When should I call a Public Adjuster? A: Now. The sooner we get involved, the better your chances are for recovering more from your insurance claim. Immediately after a property owner suffers loss, they are faced with critical decisions to be made in limited time. Because All-Lines Public Adjusters has settled many claims, we can foresee future issues and obstacles that will arise as the claim process evolves. Reviewing the insurance policy is critical in the early stages of a claim. Together with our experts and consultants, we begin to identify, research, examine, estimate, adjust and appraise the overall value of our client’s property loss. A claim is prepared involving reports, proposals, estimates, photographs, inventories and other supporting documentation that is constructed to present to the your insurance company. Negotiations with your insurance company is a process that evolves as the claim development is underway. Issues of policy coverage, local, state & federal laws are addressed. Mitigation & reconstruction of building systems are presented to the insurance company’s adjuster. All-Lines Public Adjusters excel in the advocacy of our clients. Maximum recovery & indemnity of the policyholder’s property loss is the goal. All avenues and means will be exhausted in making sure that you receive a fair settlement.